Bursting with notes of ripe banana, mango, olives and toffee, this rum really highlights why we're lucky that Worthy Park is distilling again. 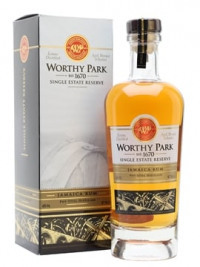 It's the first official premium rum to be released by the Jamaican estate – although rum connoisseurs have previously been able to enjoy Worthy Park through independent bottlings such as Kill Devil.The family-run Worthy Park Estate was established in 1670, and started producing rum as early as 1741. Although it was a highly successful distillery, the glut of Jamaican rum after WW2 meant that it ceased production in the 1960s. It was completely rebuilt in 2004 and now seems destined to regain its place as one of the great distilleries.